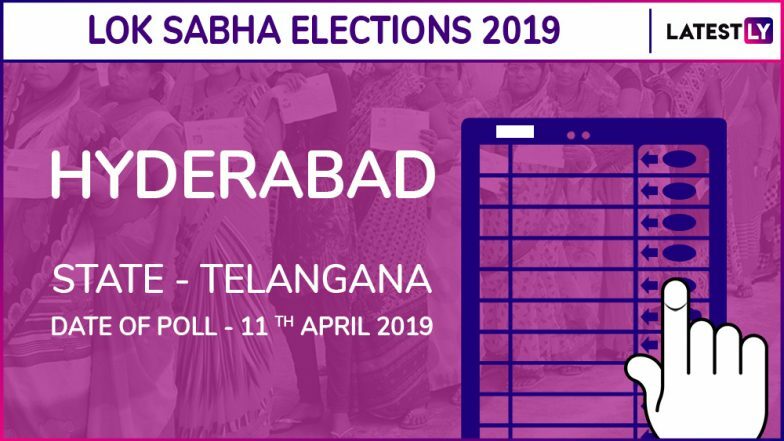 The Hyderabad parliamentary constituency of Telangana will go to polls in the first phase of Lok Sabha elections on April 11. The counting of votes for Hyderabad Lok Sabha election result will take place on May 23. The primary electoral contest is between the All India Majlis-e-Ittehadul Muslimeen (AIMIM), Congress and BJP. Lok Sabha Elections 2019 Schedule: Voting In 7 Phases From April 11 to May 19, Counting And Results On May 23; Check All Dates For General Elections. The political parties have declared candidates for this Lok Sabha constituency. The All India Majlis-e-Ittehadul Muslimeen president Asaduddin Owaisi will be re-contesting from the seat. Although AIMIM and ruling party in the state have undestanding, the Telangana Rashtra Samithi has fielded Puste Srikanth. Telangana Lok Sabha Elections 2019 Schedule: Constituency Wise Dates Of Voting And Results For General Elections. In the 2014 Lok Sabha Elections, Asaduddin Owaisi of All India Majlis-e-Ittehadul Muslimeen (AIMIM) won from the seat with 513,868 votes. He was followed in second position by Bharatiya Janata party's Dr Bhagavanth Rao and third position by Congress' S Krishna Reddy. Lok Sabha polls 2019 will take place crosswise the country between April 11, 2019, and May 23, 2019. While polling will take place in seven phases between April 11 and May 19, the national election results will be announced on May 23.